It is not often that you read a book and feel like you have been witness to a piece of art. 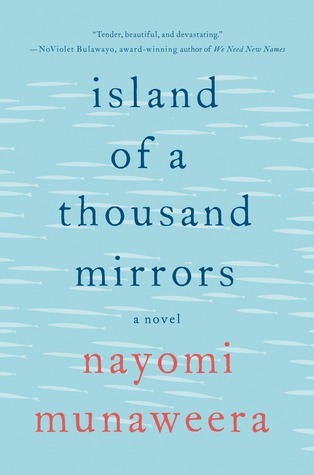 Island of a Thousand Mirrors is like art on canvas. Bold strokes, intricate detailing, vivid imagery and a pathos that grips you. By the time I was done reading, I felt awash in emotion. Grief, horror, wonder hit me in waves. Then I slowed down and savored it again. It reads like a memoir though it isn’t one, making you want to go back and re-read chapters in order to get the family tree right in your head. As the stories of women alternate and intersect, you feel your heart race and brace for the eventual outcome. The description of Sri Lanka, the aromas the food evoke, the dialect, the names of the characters all speak of careful detail. Of a story told from the heart. It delves into the Sinhala – Tamil conflict in a way that is an eye opener for someone who has but passing knowledge of the area or the civil war that has consumed the island nation. Pick it up if you enjoy the language as much as the story, if you want to read a story that will haunt you for weeks afterwards.